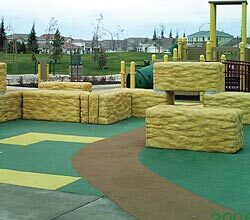 A safe, low-maintenance and durable playground surface. PLAYPOUR is a 2-layer, seamless system incorporating a resilient base for maximum shock absorption and wear-resistant top surface. It’s far safer than any loose-fill playground surface because PLAYPOUR rubber granules are bound together forming a permanent surface that doesn’t get pushed out of the way during play. Because PLAYPOUR is mixed and applied on site, incorporating logos, special designs, geometric shapes and game graphics into the surface are easy. The surface’s thickness can be altered during on-site installation to conform to different fall height requirements. PLAYPOUR playground surfacing meets 4’ to 12’ critical fall heights per ASTM F-1292-04, the industry’s standard test to evaluate a surfacing system’s ability to absorb shock. In the interest of playground safety, the International Play Equipment Manufacturers Association (IPEMA) provides a Third Party Certification service by an independent laboratory. PLAYPOUR has received written validation that its playground surfacing conforms to the requirements of the standard. Check the IPEMA website (http://www.ipema.org) to confirm product certification, its thickness and critical height. PLAYPOUR is eligible for LEED® credits. The Leadership in Energy and Environmental Design (LEED®) Green Building Rating System™ represents the U.S. Green Building Council’s effort to provide a national standard for what constitutes a “green building.” PLAYPOUR can assist architects and designers in obtaining LEED certification. PLAYPOUR is ADA compliant. When the PLAYPOUR system is installed, wheelchairs and crutches negotiate the playground without difficulty, thus conforming to the requirements of the Americans with Disabilities Act and ASTM F-1951-99 Determination of Playground Surface Accessibility. Colors may vary slightly from samples shown. Any of the above colors can be mixed in combination with another color or mixture of colors to achieve a blended, speckled look. A percentage of black mixed with a color or multiple colors camouflages dirt and reduces the price. All other factors being equal, the higher the percentage of black in the top surface mix, the lower the price. The system uses proven and industry-leading components. 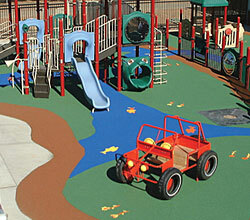 Representatives are experienced playground surfacing companies; and use certified installation crews. Playgrounds and water parks in any part of the country are assured of quality installation and professional ongoing support.